We like quirky cars and not many are more so than Toyota’s new IQ. Firstly, I think Toyota might have made a mistake with the cars name and perhaps they should have spun the letters round and called it QI, like the Friday night TV program, because just like that program, this car, is ‘quite interesting’ in fact, just like the QI presenter Stephen Fry, this new offering from Toyota is clever, charming and reliable but it doesn’t stop there as its got quite a lot of the Alan Davies warmth and fun about it as well. When the IQ was delivered to us we wondered what the point of it was, and where did it fit and as Toyota already builds a small car in the Aygo. Kind of curious, we decided to take some time out to at least give the car ‘a bit of a run’ so at least we could tell Toyota we had driven it, but fact is, after our first drives, everyone wanted to use it for its two week loan period and we ended up putting the thing on a rota to let everyone have a play with it. So what is it? Well it’s a baby car, but then its not. Sure in size, its pretty small, easily fitting sideways across many supermarket parking spaces, but it’s a bit like the Tardis when you get inside and straight off the bat, it feels like a big car (at least it does for the front seat passengers). It seems that what Toyota has done is to tear the rule book up and make a small car for those people that are used to big cars! Does that make sense? Well we have already spoken about the space up front, but the big car feel doesn’t stop there, as Toyota have built in many of the things you would normally get in a big car, so that once you’ve recovered from the shock of its size, got sat in it and set off up the road, frankly you could be driving anything and during the time I used the car, I couldn’t get over the surprise every time I got out, only to find that there was hardly any of the cars body behind where I was sitting. Spec wise, the IQ isn’t just a small car, it has all the normal big car stuff including air conditioning (or climate control on IQ2), power locking, keyless entry, electric windows, heated and folding door mirrors, rain sensing wipers, auto headlights and its got a computer that tells you what’s going on plus a decent sounding CD player, although the volume and channel change controls are located on the steering wheel and take a little time to get used to, however the engine start stop button is something everyone will instantly like. As for the techy stuff, well our car had shiny alloys, anti-lock brakes, electronic brake force distribution, brake assist, vehicle stability program, traction control and airbags almost everywhere including curtain shield airbags, a drivers knee airbag, a passengers seat cushion airbag, large side airbags, rear window curtain shield airbag and of course, for good measure, a front airbag for both the driver and passenger and whilst this isn’t strictly a spec item, the IQ’s turning circle needs to be mentioned at just 3.9m which is so impressive. So that’s an enormous amount of equipment in something that measures just 2985mm long. So how big is the car in ‘English’? Well at around 9’8” inches long, its 1 foot longer than the similarly shaped Smart Car and whilst height wise, it’s pretty much the same as the Smart at approximately 5’ tall, but the IQ is around 5” wider and Toyota certainly seem to have put that extra 5” to good use. Unlike the Smart, the IQ unbelievably is a 4 seat car, yes that’s 4 people, although it might help if your passengers are Danny DeVito and Ronnie Corbett, but all joking apart and whilst I wouldn’t want to go far in it, with a little bit of consideration from the front seat occupants, even an adult could do a local commute without experiencing DVT or loss of feeling in their legs. For kids, well its fine, although you do kind of feel vulnerable as you sit absolutely at the back of the car and that aint a good place to be if someone runs into you from behind and I don’t suppose even Toyotas sophisticated rear air-bag system is going to protect you from a rampaging 40’ truck. If I have a criticism its that whilst the front seats are comfortable enough, it’s that they don’t have much support on the sides and zipping about which is just second nature to this car, leaves you thrown from side to side, rather than supported. On the road, well the IQ is a real surprise, firstly starting with its 1.0 VVT-i 68hp in-line 3 cylinder engine, which is an absolute gem and seems to far exceed Toyota’s claimed performance figures, and sounds just great. I have to say, when our IQ arrived and I drove it, despite knowing somewhere in the back of my mind that it was a 1.0ltr engine, I had to get the books out to check, because I just simply couldn’t believe that this level of performance could ever come from just 998cc’s. The engine continues to impress not just in terms of driveability and performance, but this little 1.0ltr unit only chucks out a tax beating 99g/km of CO2 (and it’s the first 4 seat petrol car to achieve this) and indeed that means free road tax. The perks don’t end there either as we managed to get over 60mpg during our test, although to be fair it does drop down if you drive it aggressively (cant believe I just said that) but fact is, this little car is bags of fun, and its even more so when you push it hard, as it sounds great and OK, you might not be flying, but you really feel that you are and the engines audio soundtrack supports that. I did a 60 mile commute in the Toyota IQ each day, which was enough for me to take it out of the ‘city car’ or ‘urban car’ banding and put it into the ‘proper car’ section, as frankly for all intense and purpose, that’s what it is and for me, that’s what makes it so good. We test city cars and they usually do that job ok, but go on the motorway and well, it all becomes a bit different and the IQ is the first “urban” car we’ve tested that does both jobs and does them well. Toyota have a strap line that says “not just another small car, anyone can do that” and it seems they are probably right. These little cars are not for everyone, but I started off asking what was the Toyota IQ for and where did it fit and I think I might just have answered that and that answer is that its for everyone who doesn’t need a full time 4 seat car, or for parents with kids, or maybe for the empty nesters that want something comfortable and spacious without busting the bank and you know what, its also for the funky youngster as well, as its one of the most easy to drive, easy to park, yet fun to drive cars that we’ve come across in some time and of course as a bonus, this one comes with Toyota’s legendry build quality. We liked the IQ and everyone enjoyed driving it and because of its size and its shape, we had originally felt its obvious competitor was the Smart Car, but in fact, the IQ simply blows the Smart Car away as it offers everything that’s good about the Smart Car and then just adds stacks more, most importantly of which is 4 useable seats and frankly for all but the Smart Car fanatic, its really going to knock that car into touch. But the IQ doesn’t stop there; it challenges the more conventional small cars as well, by giving you all the things you’re used to, but clothing it in a smaller more convenient body shape, yet somehow managing to do some magic somewhere to allow you to fit all your stuff and people in, yet still convince you you’re driving a big car, as it just feels like you are. We think the new Toyota IQ transcends both the micro-car and super-mini classes and offers a real alternative for those people who want a small easy to drive easy to live with car and undoubtedly, the IQ will give competitors such as Ford’s new KA, Fiat’s 500, Citroen’s C1, Renault’s Twingo and of course, Toyota’s own Aygo a good run for their money, but frankly, it doesn’t stop there, as the IQ is a really strong alternative to more mainstream cars such as Corsa, Clio, Fiesta etc, purely because of the way it drives. Yes if you need to use four seats the entire time, well maybe the IQ isn’t right for you and maybe there are possibly better alternatives, but for occasional rear seat use, well it’s just fine and don’t forget, for those of you that prefer an automatic, the new IQ is available with Toyota’s ‘Multidrive’ CVT transmission. The IQ comes in at a touch under £9,000 on the road and the IQ2 is a little under £10,000 and OK, its more expensive than some of the supermini’s you can buy, but looking at its residual values (what the trade anticipate its going to be worth when you sell it in say 3 years time) the IQ comes in at around 15% more than some of its logical competitors, so whilst the front end ticket price might be a bit higher, there’s every chance you’re going to get most of that difference back when you sell it, so the likelihood is that when it all washes out at the end of say three years, it wouldn’t have cost you any more to own and run than some of its competitors that have appreciably lower on screen prices. In terms of the environment, at just 99g/km it’s pretty impressive and costs you nothing for your annual road tax and Toyota claim a combined average fuel consumption of 65.7mpg. Add to that Toyota’s renowned build quality and reliability and its all beginning to make a pretty compulsive argument in favour of this quirky little car, so if you’re thinking of having a small car, you must put this on your ‘to see’ list and if really want to convince yourself, just ask the dealer to let you take if for a test drive. Job done! 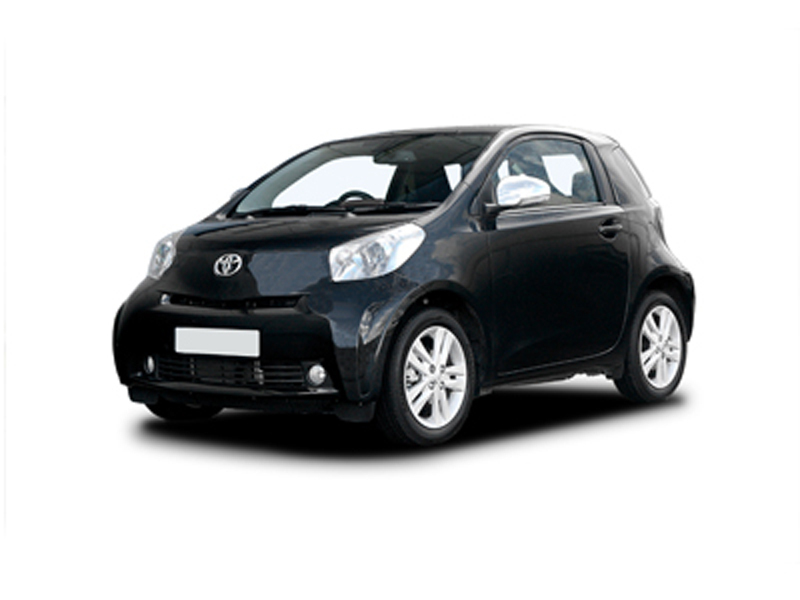 For a quotation on the Toyota IQ or any other car in the Toyota range, please contact us.